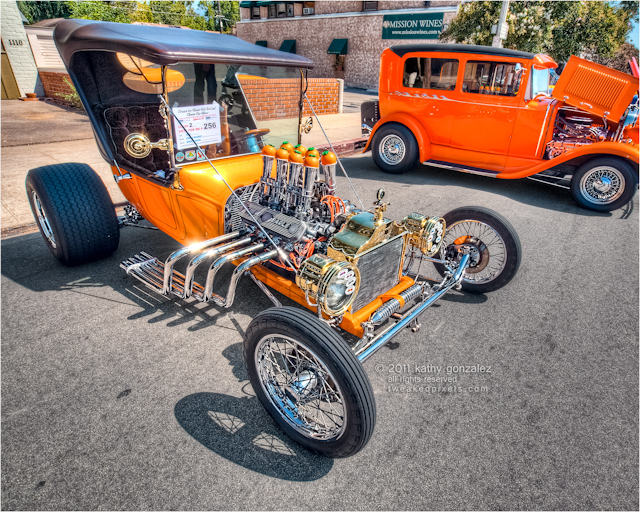 the owner of this t bucket was one of a couple of people that came over to talk to me at this show in pasadena this past summer. the usual question: are you a professional photographer? my usual response: just a hobby. really am not in the mood to sell sell sell. she did ask if i sell my pictures; of course, if you're interested. i suppose she's given up hope of seeing it by now. i think at the time, i'd already posted another t bucket or two, and hesitated posting yet another so soon. orange you glad it's here now? don't know why my price scares people away, i don't think it's that outrageous, unless you compare it to others, who must be selling cheap or just giving them away. i actually have had people ask me to give them a print for nothing. do they consider the cost of good paper or how expensive ink is? and i don't print on my desktop, typically; i send mine out for a more professional output. everyone's a photographer nowadays. look around. people with incredibly expensive cameras, with no clue how to really use them. figuring paying more money will automatically generate a better picture. just a status symbol. might as well be flashing rolexes or pimp daddy jewelry around—either way, i am unimpressed. whatever. i do what i do. if you can get the same shot from someone else, by all means, go ahead, and be happy with it. kinda thinking about closing this here digital garage. costs me more to keep it going than i've ever made back on prints. but not quite yet. i'm still getting my yayas out of posting them, whether anyone looks or not. more of a visual journal for me than anything. and, heck, gives my better half a glimpse into inner thoughts i mostly don't verbalize out loud. keeps me sane as much as anything. i think i'm just going through a period of dark and twistiness...the holidays are coming...and he knows how much i'd rather go hide in my closet until they're over.